What Makes Luxury Dress Shirts High Quality? We started by purchasing all of the top name luxury dress shirts on the market. We studied them and took them apart to see what it is exactly that makes a luxury dress shirt a high-quality item. Each brand had similar factors including the fit pattern, fabric quality, and minor attention to detail. But we also found that many lack what we believe a high-quality product should be. 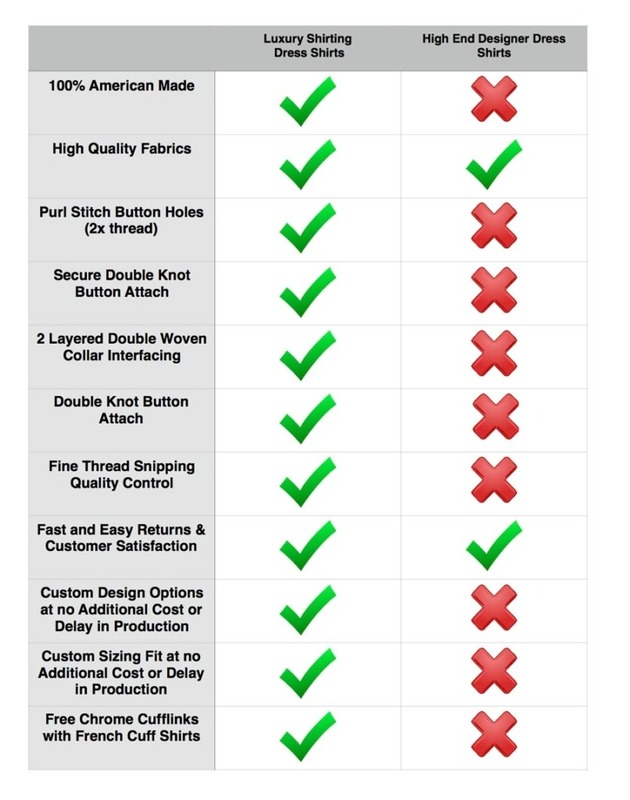 Below is a table that shows a few important factors to consider when buying a designer dress shirt. Let’s start with American Made. Why does it matter if the luxury dress shirts are made in the USA? One important element is speed to market. When there is a trend that takes a hold, you don’t need to wait six months to see it after all the production time in China. We stock all the fabric in our studio and can have new styles ready to go within only one weeks time. Another benefit to American made is quality control and custom fit and design. Since we don’t outsource, we can keep an eye on the details and we don’t pay our staff per piece rate. This means we can take the time to trim all the little thread on all the places of the finished product. We also take pride in custom fit and design and do not charge anything extra to do so. We also only have the fastest production time in the USA for our luxury dress shirts of only one business day.